June is shaping up to be a busy month at the Kenosha Creative Space, with a raft of programming that will entertain, inspire and inform. 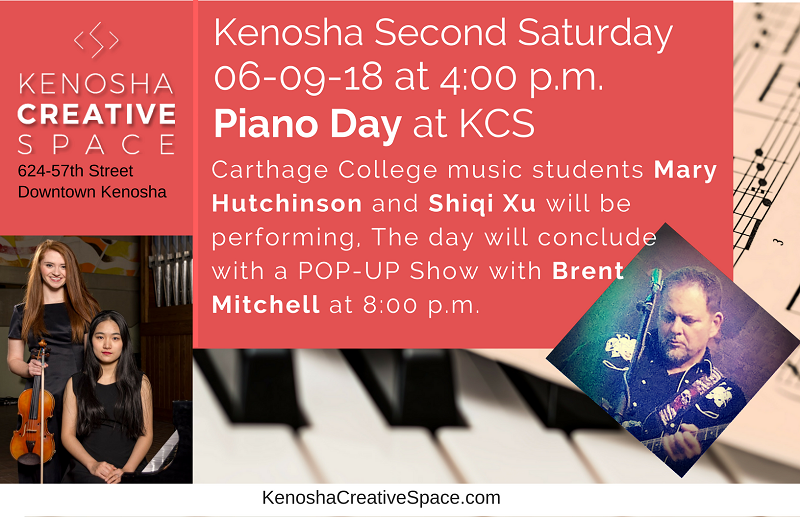 From chamber music to the opening of our latest exhibit, “Made in China,” to our first beach party of the season, there’s something for you just around the corner at Kenosha Creative Space. Best of all, these events are all free and open to the public! 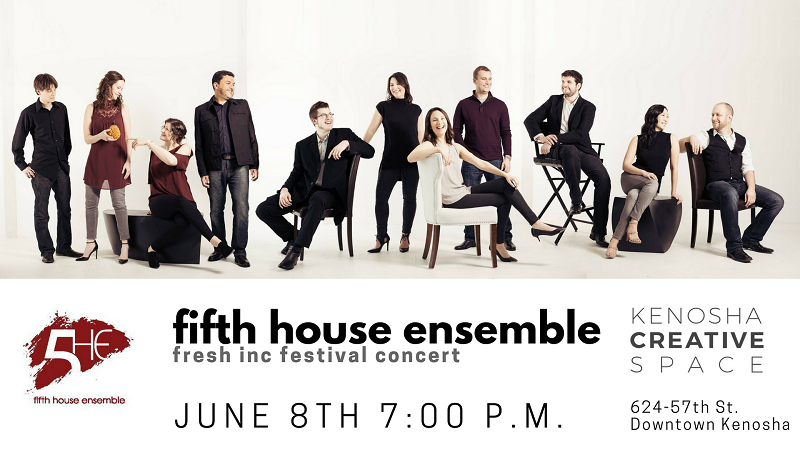 The Chicago-based Fifth House Ensemble is once again leading fresh inc – a one-of-a-kind chamber music festival for emerging musicians in the region – and this year, a free performance comes to Kenosha Creative space on June 8. Since 2012, Fifth House Ensemble has helped performers and composers to envision and launch their own authentic careers in music, rooted in adventurous genre-defying collaboration entrepreneurial thinking, and meaningful partnerships with audiences and community. Enjoy an evening of performances by the best young talent from around the nation attending this year’s festival! 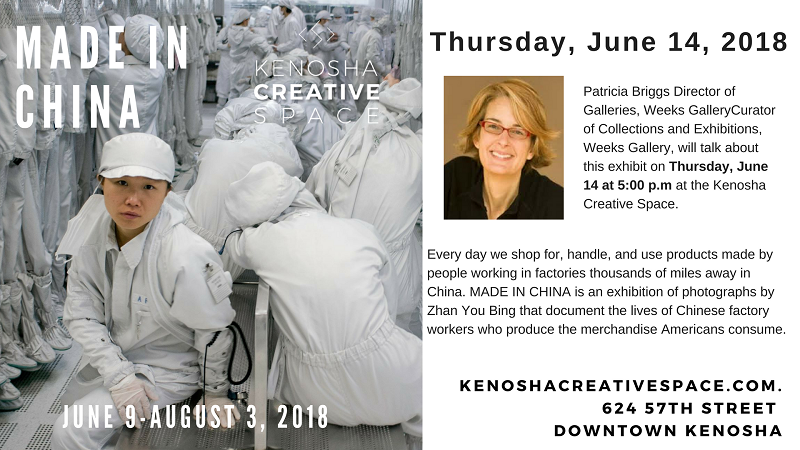 1:00 p.m. Kenosha Creative Space’s 624 Gallery opens with the local debut of “Made in China,” a traveling exhibit featuring the photography of Zhan You Bing, documenting the lives of Chinese factory workers who produce the merchandise Americans consume. This eye-opening exhibit will remain on display until the end of August, 2018. 8 p.m. Another Pop-Up Show featuring Brent Mitchell. Patricia Briggs is the curator of the traveling exhibit. Briggs is director of galleries and curator of collections at the Weeks Gallery at SUNY Jamestown Community College in Jamestown, N.Y.
Kenosha Creative Space will showcase Kenosha’s creative community and ring in summer during this three-day event. 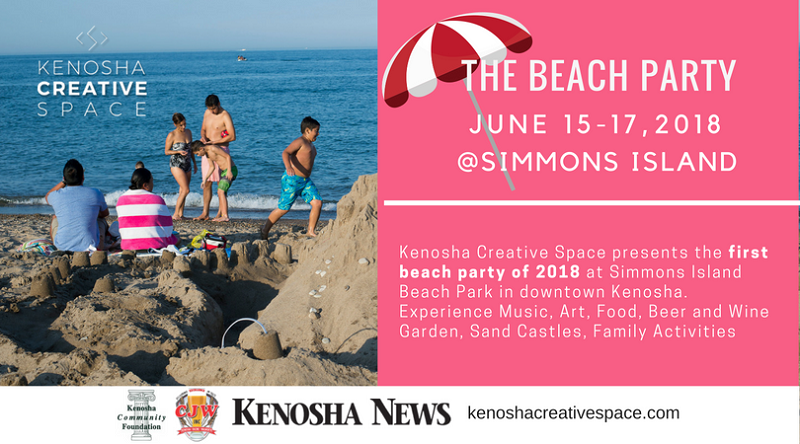 Festivities include family activities, a kids sand castle competition, live music, bonfires, a beer and wine garden, local food vendors, arts-and-crafts vendors and demonstrations, and a pop-up gallery exhibit inside the historic Simmons Island Beach House. Hours are 4 to 10 p.m. Friday, June 15; 11 a.m. to 10 p.m. Saturday, June 16; and 11 a.m. to 4 p.m. Sunday, June 17. Join us for the debut of this free, outdoor evening event showcasing a variety of local Kenosha creators, performers and artists. 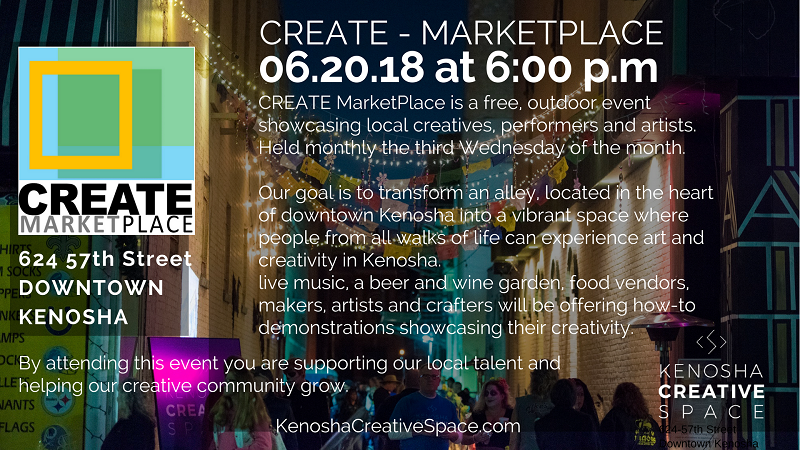 Held the third Wednesday of the month throughout the summer, the CREATE MarketPlace will turn the alleyways in the heart of downtown into an exciting showcase of the city’s creativity. As auto assembly was ending here in 1988 and Kenosha’s economy was beginning to redefine itself, anthropologist Kathryn Marie Dudley came to the city to study and document the often-confusing process of change that deindustrialization forced upon seemingly every corner of the community. 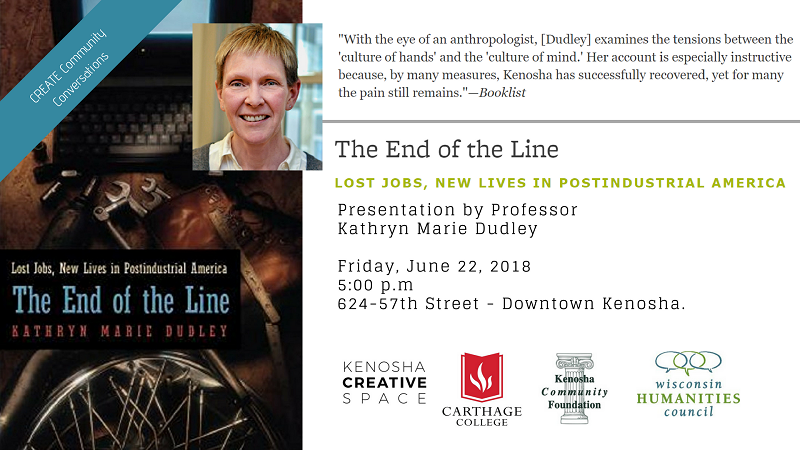 Nearly a quarter century after the publication of her resulting book, “The End of the Line: Lost Jobs, New Lives in Postindustrial America,” Dudley will be back for a postscript discussion sponsored by Carthage College, the Kenosha Community Foundation and the Wisconsin Humanities Council. The presentation will be moderated by Professor Thomas Noer. To learn more about Kenosha Creative Space and its programming, check out www.kenoshacreativespace.comor search for us on Facebook.